I met Richard Dalstrom when he came to speak at the Capernwray school I attended in Costa Rica way back in 2001. He spent a week teaching us about the book of John and this was one of the best classes I had during that term. He also just spent time with us as students, getting to know us, and being with us. I really appreciated that in him as a teacher. Later, I visited his church in Seattle with some friends and once again his teaching was invaluable. About the book: Your physical body needs oxygen in order to survive. Inhale, exhale ... one leads naturally to the other. Inhale too long and you feel as if your lungs will burst. Exhale too long and you get light-headed. The same rhythm is essential in the life of faith. You inhale life-giving strength from God through things like prayer, study, solitude, and silence. You exhale generosity, hospitality, and service to the poor. If you try to do one without the other, you wont' last very long. This fresh perspective on the classic disciplines of the faith will empower you to process the oxygen of the Spirit. Discover how you can develop a balanced spirituality that reflects the life of Jesus and keeps your faith growing stronger. About Richard: Richard Dahlstrom is Senior Pastor of Bethany Community Church in Seattle, WA, in the heart of the city, among university students, young professionals, families, the homeless, and the elderly. He is also a popular teacher in North America and Europe for the Capernwray Missionary Fellowship of Torchbearers. He holds a M.Div. from Talbot Theological Seminary. Find out more about Richard at his blog, Pastoral Musings from Rain City. Or you can follow him on twitter, @raincitypastor. 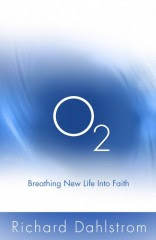 Read the first chapter of O2. Use the study guide for your own reading or group discussion. 1. Jump over to Pastor Richard's blog and leave a comment between now and October 24th. Just say hi or tell Pastor Richard what you liked about his book, or share with him how you've experienced "new life" in your faith. Winners will be announced on 10/26. thanks for the kind words... and you climb!! Me too!